This video slot, Sorceress, is set in a magical land. The mountains are made of crystal and the sky glows purple and blue. Perhaps the sorceress has something to do with this! She’ll probably have a lot to do with your wins as well. These five reels have a payout percentage of 95.11%. Sorceress has 50 win lines which pay one way (left to right). Everything about this Novomatic slot screams sorcery and magic! From the symbols to the logo to the music, it’s all out of this world. Despite the theme being quite original, the features will be recognisable to many Novomatic fans. Especially those who like to play Book of Ra as the Free Spins feature has similar Special Expanding Symbols. It wasn’t long ago that suspected sorcerers and sorceresses were burned at the stake! Before scientific discoveries, people didn’t have an explanation for strange happenings and instead blamed witches! While throughout most of history, people have been scared of, or even hated, witches, now you will learn to love them thanks to Novomatic and their brand-new game. Sorceress has Wild symbols, Scatter symbols, Free Games and a Switching Spell Feature. Of course, if you like Book of Ra from Novomatic, you will enjoy the special feature in Sorceress’s Free Spins. Fans of these other great games from Novomatic will also enjoy Sorceress: Wonder World, Eye of the Dragon, Crystal Odyssey, Lucky Lady’s Charm Deluxe and Mystic Secrets. Just like men, not all symbols were created equal! There are some symbols in Sorceress that give out small payouts and there are some symbols that give out huge payouts! At the lower-end of the payout scale, you’ll find the colourful symbols that represent card values. These are very elaborate symbols! The 9 is purple, the 10 is pink, the Jack is blue, the Queen is green, the King is red and the Ace is yellow. As the payouts get bigger, the symbols get more fascinating! The scroll and the pink potion give decent payouts. The sorceress’s staff pays quite a lot and then there’s her dragon which gives out huge payouts! The sorceress pays out double her dragon – up to 100x your bet per spin! When you spin the reels, you need three or more symbols to match up on a winline to get a payout. Each symbol has a payout for 3 matches, 4 matches and 5 matches. The biggest payouts are for x5 matches, of course. Only active winlines will award payouts – there are 50 over all but you can choose to play on however many you like. Symbols must match up on consecutive reels, starting from reel 1 on the far left. The Wild symbols and the Scatter symbol are the same! It’s a beautiful green crystal and it pays up to x500 your bet per spin, making it the highest-paying symbol in the entire game. This symbol, as a Wild, can substitute for any other symbol and, as a Scatter, can pay from any position and then turn Wild! This potentially gives extra wins on the same spin! 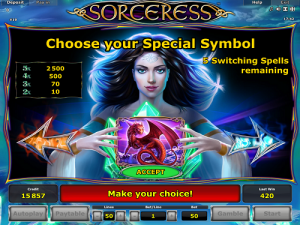 The green crystal Wild and Scatter symbol is the symbol that will trigger the Free Spins feature in Sorceress. You’ll need 3, 4 or 5 of this special symbol to land on the reels in a spin. It doesn’t matter where they land, as long as there is at least 3, you will get 10 Free Games and the Switching Spell Feature! 3 Scatter symbols will give you 5 switching spells. 4 Scatter symbols will give you 6 switching spells. 5 Scatter symbols will give you 7 switching spells. You can use the sorceress’s switching spells to help you choose the right expanding symbol for your 10 Free Games. The special expanding symbol feature works the same as in Book of Ra and some of Novomatic’s other slot games. The chosen symbol will gain special powers during the Free Games. When enough of the special expanding symbol land on the reels (either 2 or 3 depending on the symbol), it will expand to fill the whole reel and pay out additional wins! During the Free Games, some of the symbols have different payouts and even pay out from fewer symbol matches. You can see all the payout figures when you open the paytable. There are two different slides – one shows the wins for each symbol in the normal game and the other shows the wins for each symbol in the Free Games. During the Free Games, the sorceress turns the special expanding symbol bright green so you can see it clearly when it lands on the reels!